Clarins is organizing a beauty workshop exclusively for Miu and her fellow readers!!!!! Yes, you saw it... Try Before You BUY!!!!! To me, I know nothing about Clarins and I know nothing about beauty workshop. After reading Miu's blog entry about Clarins Power To Try Beauty Workshop, suddenly I got my eyes and mind open up! What a WORLD!!!!! And now, this is the CHANCE for you girls to share some Power To Try!!! A SECOND TIME beauty workshop!!! Weeeeeeeeeeeeeeeeeeee~~~~~!!!! Clarins training Centre, Amoda Building, KL. Yes + Complimentary makeover/Eyebrow Trimming + 50% discount on 1st Time Trial Facial Treament (only at KLCC Isetan Clarins). 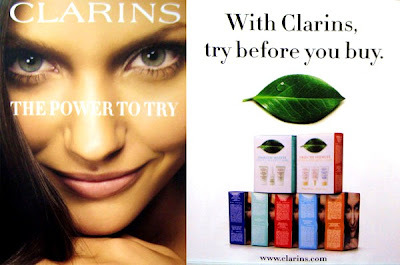 Skincare + Easy Make Up Touch Up "Clarin's Magic". So what are you waiting for??? Reserve yourself in this amazing beauty workshop. If You Miss It, Regret It!!! Hmmmm..I want to joinler....how ah?